Rest assured, the developers weren’t aiming for hilarious irony when naming this game. It’s really, REALLY hard. It’s also great, and I’ll tell you why. You control a little orange square that merrily speeds along the cool teal background. Naturally, there are lots of obstacles in the way: deadly spiky triangles, black squares you can jump onto, and big holes in the ground. You, Mr./Ms. Orange Square, will always speed forward automatically, so the only way you can avoid certain death is by carefully timing your jumps. Tap and you jump. Tap longer and you’ll jump longer. 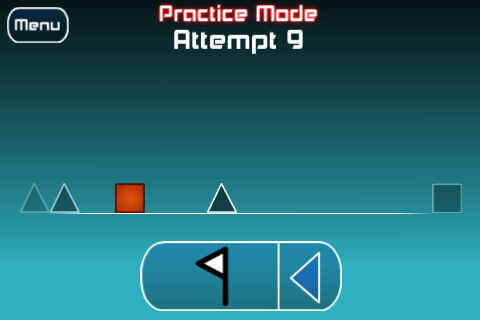 Keep your finger on the screen and your square will just bounce along continuously. The controls are deliriously simple, but you’ll need an almost superhero sense of timing to get through. The music actually helps with this in a very cool way, since the jump sounds actually sync with the techno background beats. You’re going to die a lot during the game. That’s just a given, but respawning is almost instantaneous and utterly seamless, just like everything else in the game. Most of the time, you’ll be lucky if you survive longer than five seconds. This is why Practice Mode is key in the game. You’ll still die a lot, but at least you’ll be able to make progress. Normally, when you die, you just start over from the beginning, but in Practice Mode, you have the option of placing a flag checkpoint, giving you a much needed chance to get used to the rhythms of a certain section before giving it a go. Placing the flag can also get tricky, since you usually have to do it very fast before you encounter the next deadly bit, and it’s easy to forget while you’re caught up in the heat of the moment, but this game would really be impossible without it. The controls are brilliantly responsive, so you really have only to concentrate on getting your timing just right. The game is not, in fact, impossible, but it will feel that way at times. Once you’ve beaten it, there’s really nothing more to do, but I guarantee that if you do manage this impressive feat, you’ll feel like you’ve conquered a mountain and walk through the world as a giant amongst men. AppSafari review of The Impossible Game was written by Tracy Yonemoto on May 13th, 2010 and categorized under Action, App Store, Games, Music, Platformer. Page viewed 5520 times, 1 so far today. Need help on using these apps? Please read the Help Page.